The search and rescue effort continues, even as the country began three days of mourning for victims who were mostly women and children, sources said. 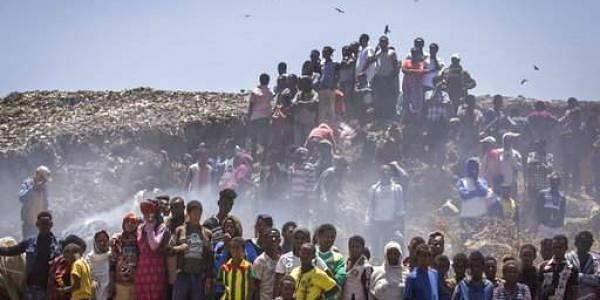 ADDIS ABABA: The death toll from a collapse at a landfill outside Ethiopia's capital has risen sharply to 113, an Addis Ababa city official said on Wednesday, as the country began three days of mourning for victims who were mostly women and children. Dagmawit Moges confirmed the new toll on Wednesday evening, while an official with the city's emergency department, Nigatu Mamo, said the search and rescue effort continued. But hopes were waning, though Nigatu said one person had been pulled out alive on Monday, two days after the disaster. Saturday's collapse of a mountain of garbage buried makeshift mud-and-stick homes inside the Koshe landfill on the outskirts of the capital. Excavators and rescuers have been pulling bodies from the black mud since then. Nigatu said excavators were being redeployed from various construction projects around Addis Ababa to help in the search. "We will continue the effort until we are directed to stop it. Our rescuers are working in two shifts, day and night," the emergency official said. It was not yet clear how the collapse occurred. Residents have said the dumping of trash had resumed there in recent months after protests at a newer landfill site. Others have blamed the construction of a new waste-to-energy plant at Koshe. Officials said they have already relocated about 300 people from the landfill, where hundreds of waste-pickers salvaged items to make a living and others found inexpensive housing. The landfill has been a dumping ground for the capital's garbage for more than 50 years. Smaller collapses have occurred at Koshe — or "dirty" in the local Amharic language — in the past two years but only two or three people were killed, residents said. Officials said the landfill receives close to 300,000 tons of waste collected each year from the capital.